Generation Kill is an amazing mini series by the creators of The Wire. What we are shown is a first hand account of what the troops of the First Recon Battalion had to endure during the start of the Iraq War. From the uncertainty of the Marines as to when it was going to kick off, to how long it would last, we get a birds-eye view of the action and how messed up it is for those US forces who have to serve abroad. You see, part of the intrigue of this series, all seven episodes of it, is that the sheer amount of realism should have the average person quaking in their shoes about the true effectiveness of one of the "greatest" nations in the world. Did you know that the average marine on deployment will actually end up spending their own wage (or part of) on their own protective gear? Scrounging for batteries for Night Vision Goggles is just another task in the day for the First Recon as they struggle to get their vehicles working and weapons firing, whilst the brass drive about in fully rigged out units. This is a gritty series, and it certainly doesn't back away from any unpleasantness. The war over there is fully depicted in all it's madness and the way that the marines react to it. Based on a book titled Gen Kill, this is a series that when it aired in the States, it achieved acclaimed from both active and retired personell for its commitment to realism regardless of the light being shone on the enemy or the marines we are lucky enough to be along for the ride with. 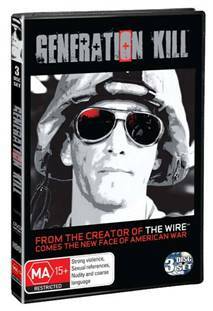 Spanning across three DVDs, Generation Kill is a must view series for the main content, then make the time to watch and listen to the extras. A word of warning to the squeamish or easily offended, this is probably a series that will do just that for you. Gen Kill is not a gentle series by any stretch of the imagination and all is revealed here, from the cruelty of battle to the racism of the enlisted men, the aim is to present an honest account as opposed to glorifying the conflict. You might be shocked at times but you owe it to yourself to try this one out.